At 3pm Eastern today, I’ll be in sitting in the kitchen, surrounded by bottles of scotch. How is this any different than a normal 3pm in Chez Dietsch? Today, I have an excuse. 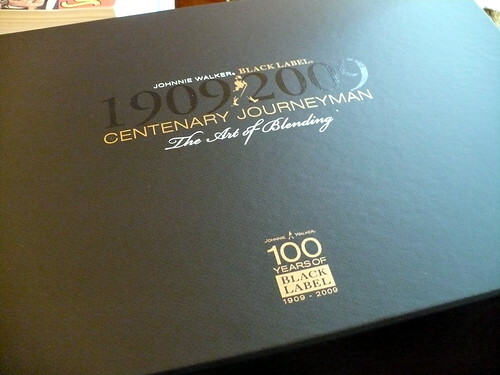 Johnnie Walker’s black-label blend turns 100 years old this year, and to celebrate, Johnnie’s jetting his master blender, Andrew Ford, over to New York City, to lead a webcast focusing on the blending process. I received an invitation to the webcast a couple of weeks ago, and shortly after I accepted, the FedEx man brought me a large box of kit. 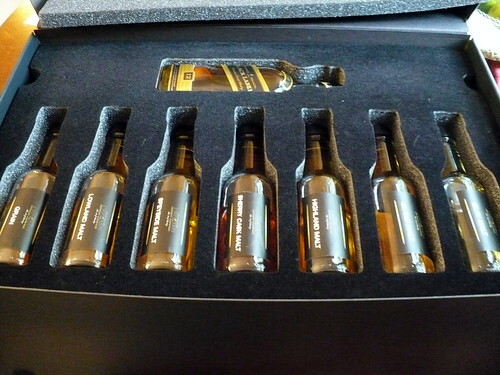 Inside the box, I found seven sample bottles of single malt and grain whiskies, a small bottle of Johnnie Walker Black, a nosing glass, a measuring beaker, a funnel, and an empty bottle. Andrew Ford will be walking us through the process of blending scotch whiskies. He’ll also be taking questions, so if there’s anything you want to know, leave a comment here, and I’ll try to pass it along. One question I have is why the grain whiskey appears to have been barrel-aged. 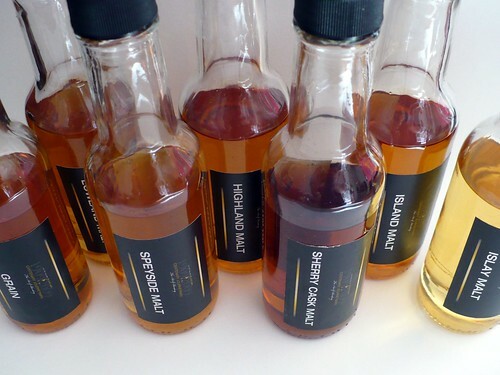 I’m also curious about the number of whiskies they sent–one grain whiskey plus six bottles from various regions of Scotland (or in the case of the sherry-cask whiskey, a type of finishing method). Black Label is blended from at least 40 different whiskies. I know that Walker couldn’t possibly have sent 40 bottles without breaking their bank. Even this shipment wasn’t cheap, I’d wager. Now, what I don’t know is whether each of those bottles is actually a single malt, or if each bottle has a blend of several malts–say, several malts from the Islay region–to approximate the 40 whiskies that comprise Black. This is my beautiful house! This is my beautiful wife! Sorry for the non-cocktail digression. 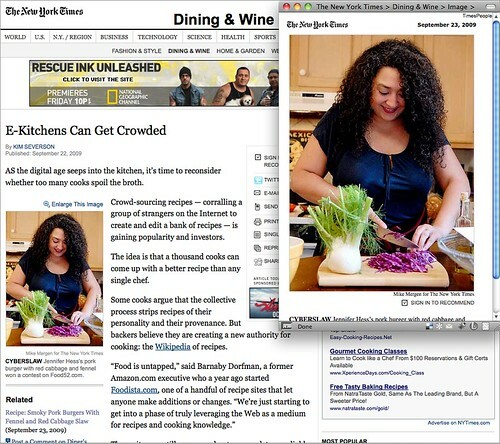 My wife, Jennifer Hess, who blogs at Last Night’s Dinner and takes most of the beautiful pictures you see here, is featured in the Dining and Wine section of Wednesday’s New York Times, in a piece by Kim Severson about crowd-sourcing cookbooks and recipes. That’s Jen above, so nice I had to show her twice. To say I’m proud of her wouldn’t even begin to scratch the surface. And if you’re thinking, “Dude, I met you at Tales or somewhere else, and how’d you get so lucky.” Believe me. I know. 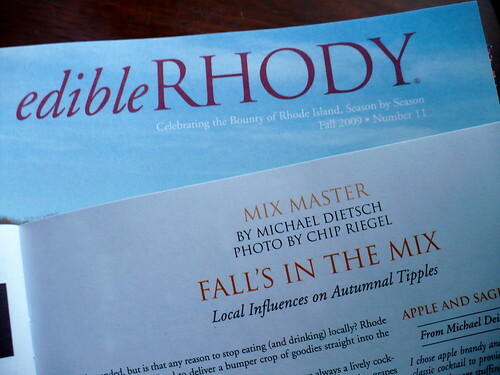 My quarterly cocktail column for Edible Rhody starts in the latest issue, which is hitting stands this week. I should be able to post the full content next month, but for now, I urge anyone local to go out, grab a copy, and grab a croissant from Olga’s or a hunk of cheese from Farmstead while you’re at it. 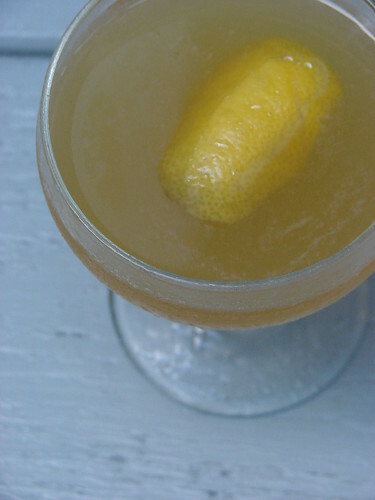 The focus of the column is on using seasonal, local ingredients in cocktails. Each column will have two recipes–one that I mix and one from a local bartender. Trust me, my focus will always be on classical techniques and interesting spirits. There’s already enough vodka flowing in Rhode Island! Just to hint at what’s to come, it looks like my winter submission will be the Tom & Jerry, made from locally produced milk and eggs. Are you ready for this? Are you hanging on the edge of your seat? After delays of the bad kind (an inability to find a certain rum without special-ordering it) and of the very, very good kind (more on that, I hope, on Wednesday, 9/16), I finally had the chance to run a couple of El Presidente recipes through their paces. Verdict? One recipe is excellent, and the other, not so much. Proportions will vary from drink to drink as I try various permutations. Let’s start with the Not So Much recipe and explain what might have gone wrong. I started here, with the classic recipe. For the rum, I used Myers Platinum, as Paul Clarke recommends in that link. It was this rum that I had to special-order. I have no idea why; every liquor store I’ve been in in Providence carries the Myers Original Dark, but not one of them carries the Platinum. I wanted the Platinum for three reasons: first, I like the way Paul describes how it tastes in the drink; second, I’m not a huge fan of Puerto Rican rums, and even less a fan of Bacardi; third, and most important, one major point of this project is to get me trying new rums. And the Platinum is good enough for mixing, I think. Let’s back up. Myers’s Platinum Rum is a white rum (obviously–platinum should give that away), pot-distilled, aged in oak, and charcoal filtered. The aroma’s not complicated, I’d say–tones of vanilla and caramel, of course, from the oak aging, plus a hint of chocolate. The flavor’s light and crisp, without the chemical aftertaste of some white rums. Some say it’s a bit flat; I don’t agree, but then I don’t have the experience with rum tasting that others do. 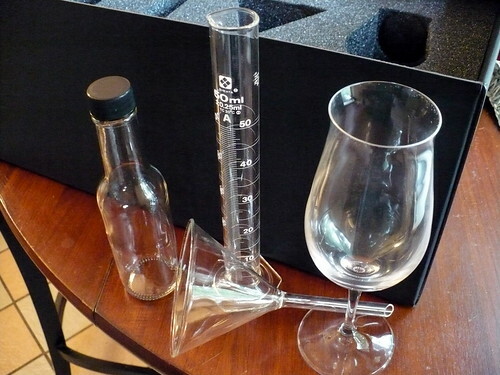 This is a rum for mixing, though, not a rum for sipping. For the curacao, I went with Grand Marnier. (Yup. If you have experience with this cocktail, you’re starting to see why this version didn’t work for me.) Orange curacao is strangely hard to find around here, so I decided to grab something from my shelf rather than getting a special bottle. And I had a feeling the Grand Marnier might not work for me, but I thought I would learn something about building rum drinks by trying anyway. At the classic proportions (2 parts rum; 1 part each of vermouth and GM; and a dash of grenadine), the drink bombs. The Grand Marnier gallops over every other ingredient. You can taste the rum, but it’s not the centerpiece that it should be. You cannot taste the other ingredients, or at least I couldn’t. A Platinum Presidente merits further exploration, but it certainly needs work. Now this is a much better drink. Delicately balanced and crisp, this version lets every ingredient express itself. A note or seven on the ingredients: Mount Gay Extra Old is a brown rum, with aromas of caramel, toffee, warm spices (cloves, allspice, nutmeg). On the palate, it’s spicy and almost peppery. A great sipping rum, this one also mixes well, as this cocktail demonstrates. Rhum Clement Creole Shrubb is among the drier of the orange liqueurs, a little more subtly orange, and generally less of a hit on the palate. There’s a reason Grand Marnier is often sipped neat after dinner: it’s so viscous and sweet that it coats the tongue and palate, easing them to sleep after a great meal. The Creole Shrubb isn’t like that; I wouldn’t say it’s an eye-opener or an aperitif, but it’s certainly peppier. I’ll be working through other variations in the next few weeks, but it’s safe to say, Robold’s version is the one to beat. To continue my month of rum, I want to turn now to a classic rum cocktail that’s sadly little known outside of cocktail-geek circles–the El Presidente. But which El Presidente cocktail? There appear to be at least three. A 1967 issue of Gourmet magazine discusses a version made of gin, orange juice, apricot brandy, pineapple juice, and grapefruit juice, with a little bit of grenadine. My god, that sounds awful, and just the sort of crap people were drinking in the 1960s. Why even bother with the gin? Just use vodka and enjoy your sticky sweet fruit juices without anything flavorful getting in the way. There’s a daiquiri variant (remember, a daiquiri is simply rum, simple syrup, and lime juice) that takes away the simple syrup and adds pineapple juice and grenadine as the sweetening agent. That sounds like a good drink, but it’s not what I’m going for. Nope, the version I want uses rum, orange curacao, dry vermouth, and a hint of grenadine. This version arose in Havana, during or just before Prohibition. Accounts, however, differ as to the specifics. Cocktail historian David Wondrich attributes it to an American bartender named Eddie Woelke, who fled the Great Experiment and set up shop overseas, as many American bartenders did during those years. Woelke apparently bounced around a lot, tending bar in Philadelphia, New York, Nice, and Paris, before finally coming to Havana, where he created many once-popular cocktails, including the Mary Pickford. By this account, Woelke created the drink at the Jockey Club, naming it for then president Gerardo Michado. Eric Felten, writing in How’s Your Drink?, however, isn’t so sure. He offers an alternative explanation–that the drink was created (by an unknown bartender, presumably, since Felten doesn’t name names) at the Vista Alegre Club in Santiago. In this version of history, the drink is named not for Michado but for an earlier presidente, Mario Garcia Menocal. Who knows? As Wondrich has said elsewhere, the history of the cocktail is inevitably murky because it’s a history that goes down in bars, when people are drinking. Nonetheless, El Presidente is a drink of Cuban origin, invented to please Americans who traveled to Cuba during Prohibition to drink legally in an exotic environment. Steamships would leave ports in American cities, bound for Havana, and as soon as they entered international waters, teams of stewards would circulate through the ship, bearing cocktails for the passengers. Among the drinks invented or popularized during this period were the daiquiri (and Hemingway’s version, the Papa Doble), the Cuba Libre, the Mary Pickford, and the El Presidente. But enough of the history lesson. As I work through my El Presidente variants, I’ll be trying various combos of rums and orange liqueurs. The vermouth and grenadine will remain the same, although I may play with the quantities a bit. So it’ll be instructive, at this point, to describe and define the classes of orange liqueurs that are on the market. Their differing qualities will bring various flavor elements to play in the drink. Curacao. You’ll notice the recipe calls for orange curacao. This isn’t an unfamiliar product; most people who’ve ever attended a party or two in their lives have seen artificially bright drinks made from a similar product, Smurfy blue curacao. Because of this, curacao has a bad rep, I think, reminding people of cheap party drinks, bad decisions, and awful hangovers. I know that I personally seldom seek out bottles of curacao when I’m restocking my bar. 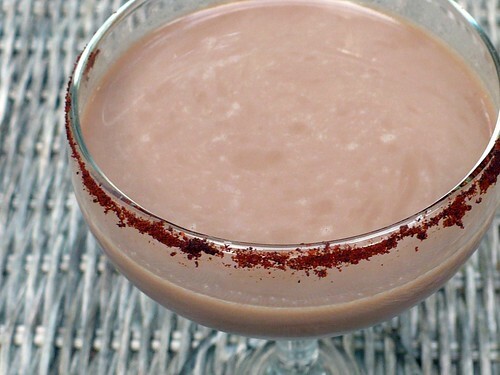 But curacao doesn’t have to be merely another element in a regrettable weekend; a well-made curacao is an excellent ingredient for many different cocktails. It’s made by taking bitter orange peels, drying them, steeping them in neutral grain alcohol, removing them (and adding other herbs), and then distilling the results of that maceration. The most common brands available are Bols, DeKuyper, and Hiram Walker. These are, from what I understand, pretty interchangeable in drinks. Grand Marnier. According to some sources, Grand Marnier is a grand curacao–that is, a premium version of curacao. With a brandy base, Grand Marnier is the richest and perhaps the booziest of the orange liqueurs. Mixing with it requires a subtle hand. Triple Sec. Sweeter than curacao, triple sec is another orange liqueur. Also made from bitter orange peels, it’s triple distilled and therefore higher proof than curacao. Cointreau is a brand of premium triple sec. In fact, Cointreau carried the words “triple sec” on its labels until lesser varieties came along and cheapened the term. Creole Shrubb. Finally, we have Creole Shrubb, which is a different beastie entirely. Instead of having a base of neutral grain spirit or brandy, Shrubb is based on rhum agricole, a type of rum built on sugarcane juice instead of molasses. Again, this product starts with dried orange peels, which are macerated with spices in sugarcane juice, and then blended into a mix of rhums agricole before being aged in oak barrels. Shrubb is crisper and spicier than any other product on the market. Mixing up the variants begins tomorrow. Cheers.